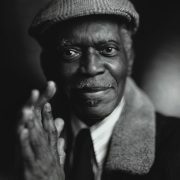 If there were to be only one jazz musician to grace the cover of AARP The Magazine, the award-winning monthly lifestyle periodical targeted to people over 50, it would have to be Hank Jones. A consummate pianist, Jones was just a month shy of celebrating his 90th birthday when he performed at the 29th annual Montreal International Jazz Festival with four winning duo performances for the event’s Invitation Series. Expectations were high for Jones’ other two duet partners, Lovano and Haden, given that they’ve both recorded fabulous discs with Jones. Lovano has been a major crusader for Jones as of late, recruiting him his albums I’m All for You (2004), Joyous Encounter (2005) and last year’s Grammy-winning duet, Kids: Live at Dizzy’s Coca-Cola. Haden had shared his love and history with church music on the absorbing 1994 classic, Steal Away. Understandably, Jones and Lovano concentrated on material from their recent partnership, uncorking sparkling makeovers of “Quiet Lady” and “Lady Luck” and “Ornithology.” Sticking mostly to standard ballads, Jones’ warm, discreet yet almost ebullient accompaniments underscored Lovano’s rhapsodic tenor saxophone improvisations magnificently. The sparse setting, however, may have been too revealing in that Lovano’s tone seemed to suffer when he reached into the lower register of his horn, which softened it. Nevertheless, the empathy and imagination shared with Jones on “Lullaby” and “The Very Thought of You” more than made up for the blemishes. Throughout some of the performances’ rough moments, Jones revealed himself a true gentleman, as if he was saying that dealing with the bumpy moments, then laughing at them, is the true meaning of living life to its fullest.